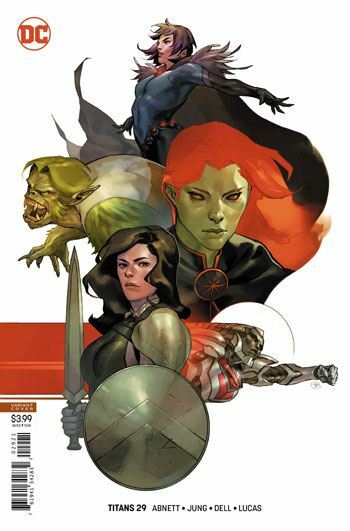 So the last issue of Titans was a Drowned Earth tie-in, which saw Donna Troy, Steel, Beast Boy, Raven and Miss Martian all wind up getting “Boom Roomed” away. This issue centres on the interstellar castaways, leaving the Drowned Earth storyline to the side. I suppose that’s a good thing. I found the story interesting enough. Some good thought put into their struggle just to survive on the strange planet they find themselves on. There is also an interesting development with Miss Martian, which leads to the climax of the story. But honestly, I really wouldn’t have minded seeing the Titans still on Earth. Particularly Garth, who just came back last issue. Drowned Earth looks to be an enjoyable story, and I wish this book hadn’t opted to send most of its heroes far away from it. Frankly, between that and the way Heroes in Crisis has been largely ignored, it makes me wonder what is up with this title. To actively avoid big crossovers really only works when your own storylines are so compelling they cannot be looked away from. And I have to say it, Titans just isn’t there. Sure I am enjoying the book well enough, and interested to see where it will go. But nothing about the series right now is making it a must read. I would have opted for the Drowned Earth over Titans in Space. But that was not the decision of the powers that be. Titans in Space it is. Maybe, if I’m really lucky, Earth won’t have dried out by the time they get back.